If you haven’t submitted your proposal for speaking at Canada on Rails, you should do that soon! I submitted my talk, “How to Explain Your Obsession With _Why to Your Grandparents” the other day. I’m pretty sure that it’ll be accepted and in April I will be explaining to you how I tried to explain _Why to my grandparents. Heading to San Francisco, CA. Meet Up? Jeremy and I are flying down to San Francisco (well Petaluma) tomorrow night for some on-site work with one of our Rails consulting clients. We will be driving back to San Francisco on Friday night and will probably have a few extra hours to kill on Saturday before we fly back to Portland at around 6pm. So, pretty much all day Saturday is open. If you have some pointers as to where two geeks that love free wifi + (coffee|beer) should go… please advise. We will be staying downtown… so things within walking distance of that area would be ideal. I announced almost two weeks ago that Jeremy Voorhis was taking the position as Lead Architect at PLANET ARGON. 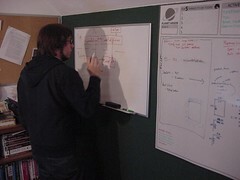 I took a picture of him yesterday when he was discussing a clients project that we’re currently refactoring. The project comes to us with an existing schema, codebase, and opinions. We’ve been working on several of these types of projects together in the past few months… which prompted us to deciding to start our project, Refactoring Rails. It’s been great working with him in person. He, like some of the other developers that we call upon for some projects, had been assisting us through IRC, IM, and BaseCamp... and being able to be in the same office together… has been very beneficial. P.S. You can see a drawing that Allison created of Jeremy on the PLANET ARGON about page. ...off to get some sleep. I was interviewed by CRN regarding my personal thoughts on how the release of Oracle Express might compete with MySQL and PostgreSQL. A question was posed on the Rails mailing list concerning how one would go about adding CONSTRAINTs to the database tables with ActiveRecord::Migration. Databases evolve and I have recently found the Migration structure to be perfect for handling iterations and schema changes. Using the #execute method has helped move more of my code into the Ruby/Rails framework… and that just makes things easier to manage in the long-run. This is the approach that we are using at PLANET ARGON with some of our current client projects. execute "ALTER TABLE bees DROP CONSTRAINT beehive_id_fkey;"
This gives us an easy way to use the standard, #create_table syntax for building our tables with Ruby… and then we can slap these constraints on later. I have found that this approach is really useful with testing in Rails. When I think that I have everything working great (without CONSTRAINTS in PostgreSQL), I run another migration to add a bunch of foreign key and data constraints to the tables and… run my tests again. This has helped me gain some trust in Active Record while still giving me that comforting feeling that PostgreSQL is acting as the body guard for my data. Even if you don’t end up using Migrations to handle these types of database schema changes, I would highly suggest that you model your implementation after this. I’ve worked with many database schemas and this just makes it easy to add your new change and run one command to commit it to the database. Yesterday, the PostgreSQL team released version 8.1. Take a peak at the latest changes and enhancements.